Pumpkin Chocolate Cookies. The perfect new recipe for you pumpkin lovers! These are seriously delicious and couldn’t be easier to make. There is no cooking required! These would make the perfect treat to take to any fall party or even Thanksgiving. They taste like a bite sized pumpkin pie. Heaven in your mouth. All you need is just a handful of simple ingredients and a few minutes. These pumpkin chocolate cookies are vegan, gluten free and paleo approved! You can easily make your own cashew butter. I show you how in this video. For more videos, you can subscribe to my You Tube Channel. The perfect little bite of pumpkin pie drizzled in chocolate! In a food processor , combine all the ingredients until smooth. Place in the fridge for 5 minutes to firm slightly. Place the baking sheet in the freezer while you make the chocolate coating. In a double boiler, melt the chocolate and coconut oil. 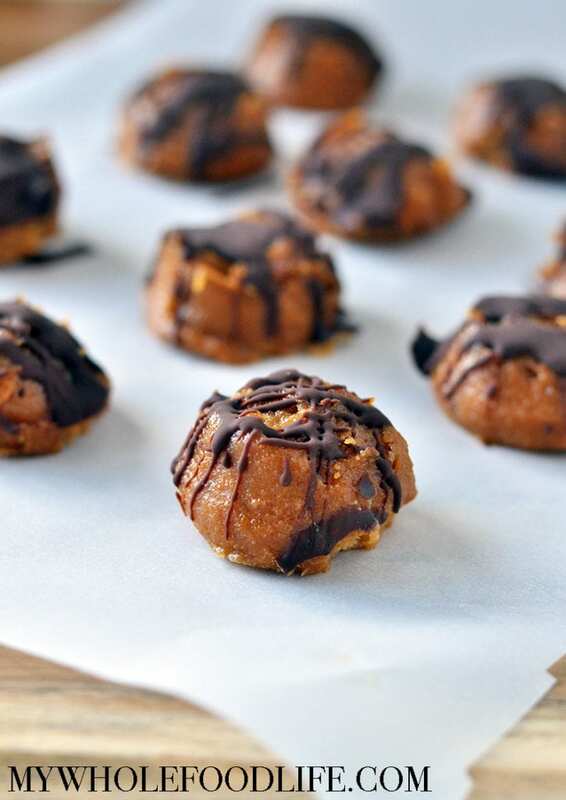 Use a spoon to drizzle the chocolate over the cookies. Place back in the freezer for 15 minutes to firm up. Once these are firm, you can store in the fridge or freezer. They should last a couple weeks in the fridge and several months in the freezer. Enjoy! These look perfect. So easy too! Daughter has allergy to tree nuts what can I use in place of almond flour? Sounds yummy, I've been in the mood for pumpkin since the weather is starting to get cooler. Thanks for the recipe! I'm wondering if I can use raw cacao, maple syrup, and coconut oil for the chocolate drizzle. I'd rather not use chocolate chips. Yes you can, but if you do that, these need to be kept in the freezer. Hello, Melissa - do you have calorie information for this recipe - thanks in advance. You really think these will last that long? :-) I don't think I will have to worry about putting them in the freezer. Just saying! Hey! This is amazing! Thanks for sharing! What do you think about not adding the ginger. I'm not much in love with it. Thanks Tiffany! I think it would be find to leave out. Hi thanks for sharing.. may I know what is almond flour? Do U mean powdered almonds? And another thing is I believe the pumpkin have to be cooked first?